The contemporary art gallery Doppelgaenger was established in 2012 in Bari, Puglia (Italy) in the old city centre after a meeting between gallery manager Antonella Spano and collector Michele Spinelli. As the very name itself suggests, Doppelgaenger pursues two lines of artistic enquiry. The dual nature of the project focuses on both the more contemporary studies in figurative art and experimental work in video art, from installation and performance. Doppelgaenger’s principle raison d’être is to show the commonalities between the two areas and use this as a device for comparison and study. The gallery is located in the Palazzo Verrone in the heart of the old city, an extraordinary architectural mélange, which over time, from inception as mediaeval tower house has become a noble Renaissance palace and is now a place which plays host to the Contemporary arts. Moreover, the gallery intends to put an attentive eye on artistic publishing production, meaning the art book as an object whit a clear intrinsic value. Doppelgaenger acts both as an exhibition space and living residence simultaneously. The gallery managers and their artists inhabit the palace choosing to allow their work and private lives to overlap and these two spheres are constantly intertwining with each other. Within the natural confines of the gallery Doppelgaenger adopts the concept of Xenìa. Xenìa is a residency project run in concert with the age-old concept of hospitality and operates according to an unwritten set of rules and customs. The programme has a revolving schedule so that the artists in effect become pro-tempora members of the gallery, which will allow them the opportunity of creating new dimensions. Their activities and their primary rôle will result in the time spent in residency being totally devoted to the individual demands of creating art. Xenìa is also a vehicle for interpreting the urban surrounds, which, due to their historical interest and cultural characteristics, can inspire artistic creation. 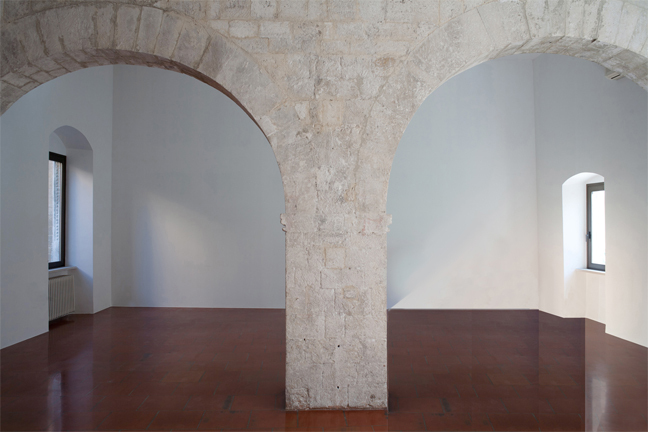 The Doppelgaenger gallery is not located in the Palazzo Verrone (one of the most important and symbolic buildings of the old historical centre of Bari) by mere chance – this is a setting where the artists can integrate with their surrounds and forge a powerful sense of symbiosis with them. This idea comes to fruition through adopting the practices and customs of the setting as one’s own, through reinterpreting its traditions and concepts, being witnesses to its historic and recent past, a place which will forever be inspirational for creating art.